It’s a beautiful gray day in Seattle. Dark for summer. A gossamer mist. A little ominous. 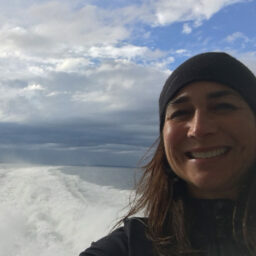 It doesn’t worry me that we are heading out into Puget Sound in search of the largest and most amazing creature in the world – the Orca Whale. I’m floored that these ridiculously stunning mammals live moments from our bustling downtown. 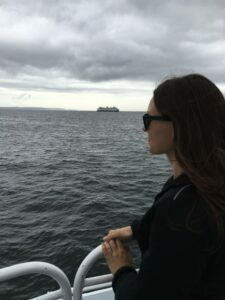 After driving 20 minutes north of Seattle to Edmonds, we board the Chilkat Express, a decent size boat in a small fleet owned and operated by Puget Sound Express, a business that’s been run by the Hanke family for the past 30 years. The sweet smell of homemade blueberry buckle is pervasive. It’s a recipe that Great Grandmother Hanke cooked up decades ago and that they happily share with their passengers. 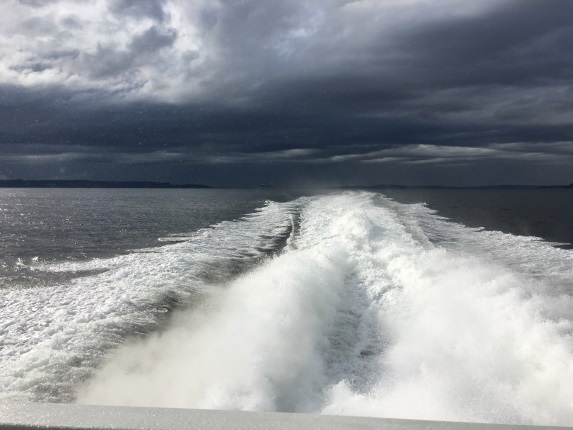 With a 3,000-horsepower engine that kicks up a frothy wake, the Chilkat moves at 40 mph, getting us quickly outside Admiralty Inlet off of Whidbey Island and into the Strait of Juan de Fuca. Today, dad Pete is driving the boat and daughter Sarah is our guide. 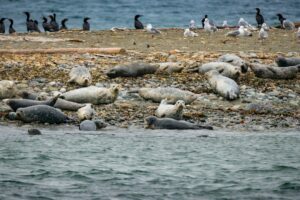 She shares a fascinating history of the area and tips on what to watch for as we scan the water for whales. “Look for bird activity above the water,” Sarah announces. “It usually indicates that there is a bait ball, or something under the water that is pushing a big ball of fish to the surface.” Cool. “There’s something over there!” a passenger exclaims. Everyone scurries to the front deck of the boat, holding their binoculars (and their breath), afraid to blink. A minute goes by . . . then another minute. “There it is,” someone says. “There are two,” Sarah observes. Sure enough, two Minke Whales (pronounced Mink-ey) right in front of us. At 26-feet long, these baleen whales are smaller than orcas but no less spectacular. Considering they are extremely fast swimmers, illusive, and difficult to spot, this is a rare treat. We watch quietly for some time before beginning our trek back toward Edmonds. Along the way, we stop alongside Minor Island, a tiny piece of land that has been deemed a wildlife refuge in the middle of the Strait. 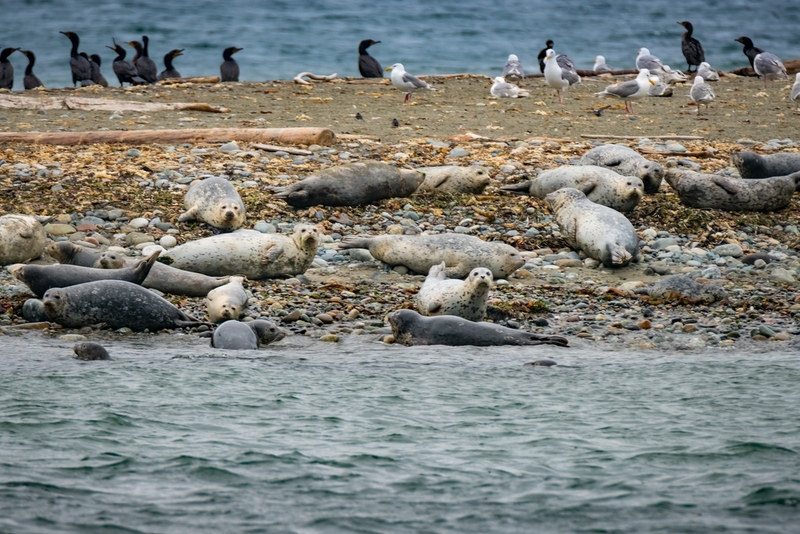 It’s packed with harbor seals, bald eagles, and puffins. After about 3 hours at sea, we are back at the marina in Edmonds. Our half day cruise is over and I feel like I could have stayed out all day. We’ll be back in Seattle at 6:30, just in time for dinner. Visit Seattle outing on Puget Sound Express whale watching tour. Smith Island Stellar sea lion rookery. Photo by Alabastro Photography. 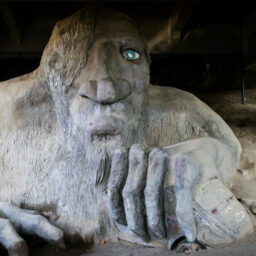 Alisa Carroll previously worked in public relations for Visit Seattle. When not discovering new restaurants and places to explore downtown, she’s camping in the mountains or attending local music festivals with her husband and 6-year old son.